Reclaimed teak is enormously resilient and retains its integrity in the face of inevitable knocks and marks that a well used piece of furniture will experience. Rediscovered teak is the ultimate tool or product in sustainable furniture. How is there so much reclaimed teak? There are 17,000 islands in Indonesia where teak is abundant. Traditionally this was used for building houses and other structures so there is a good supply of reclaimed teak. How can I be sure the item I am buying is made from reclaimed teak? It’s simple: Check for accreditations. When it comes to buying sustainable furniture the only way to know for certain how ‘green’ a company’s products are is through accreditation with a legitimate organisation. Be aware of companies which develop a system themselves as usually this is not independently verified. Why don’t Raft use plantation or new teak? What is wrong with using plantation or new teak? Forests support up to 1.6 billion of the poorest people in the world. Sixty million indigenous people and countless species of plants and animals are wholly dependent on forests for their lives. Felling teak has an enormous impact on the environment. The process is actually cheaper than sourcing reclaimed teak but as a company we are committed to providing sustainable furniture. Why should I buy reclaimed teak? Reclaimed teak has been seasoned for many years, producing a beautiful mature grain and rich colour unlike plantation woods. It is a very hard, heavy, strong wood, distinctively oily to the touch. This oil in the wood makes teak very durable. The most sustainable furniture is made from recycled or reclaimed hardwoods as these are the most durable and are life and family-proof. Nicks and marks are an inherent part of the furniture, and a reminder of the historical character of the wood. If requested we can make any leather or fabric sofa with removable arms or even removable back and base. Your sofa will be assembled on-site by our skilled delivery team and is easy for you to disassemble and reassemble at a later date. Is the quality of my sofa affected? No the integrity of the sofa remains intact. Once the sofa is re-assembled in your home you will not be able to see any bolts as all bolting mechanisms are done from underneath unless you have a vertical break. Where a unit cannot fit into a property using the divisions above we may need to make your unit with a vertical split. In this instance a join in the unit will be visible but not noticeable and will be bolted together for stability and to restrict movement. Are my products under warranty? There is a 10 year parts and labour guarantee on the frame of all our sofas. Our fabrics, leathers and interiors are of the highest quality with the entire unit hand made here in England. Any faults in the fabric or leather will show up within the first year and we will repair or replace those pieces if necessary. My leather sofa shows dark markings. Is this normal? At Raft we only use semi or full aniline hides where the method of tanning achieves a desired, natural looking leather. The process allows the leather to breathe and produces a delicate, soft, supple leather that has a very natural feel. By using this clear tanning process you will be able to see insect bites, barbed-wire scratches and other environmental markings that might appear on the hide. This only adds to the character of your sofa or leather item. Other cheaper leather sofas use corrected hides where the leathers go through a considerable process of sanding, buffing, stamping and dyeing with a polymer (plastic) coating applied on top. This creates a uniform look and makes the leather sticky to the touch in summer and cold in winter as it does not allow the leather to breathe. How do I care for my teak items? Click here to download out Product Care Guides. Due to timber movement a line has opened up on my table top – can this be rectified? This is perfectly normal with natural timber. Sometimes there is still some moisture in the wood and when this dries out it causes the timber to shrink slightly. Depending on your post code we will rectify this situation on site or collect, restore and return your item. For more information contact customer service. Why will my Teak order take 10-14 weeks? All of our reclaimed teak items are handmade to order which can increase the time it will take to get to you. We have such a huge range that it is impossible to keep every item in stock and we do not want to waste such a valuable resource as reclaimed teak on making items unnecessarily. My item has paint/indentations/blocking on it, is this normal? 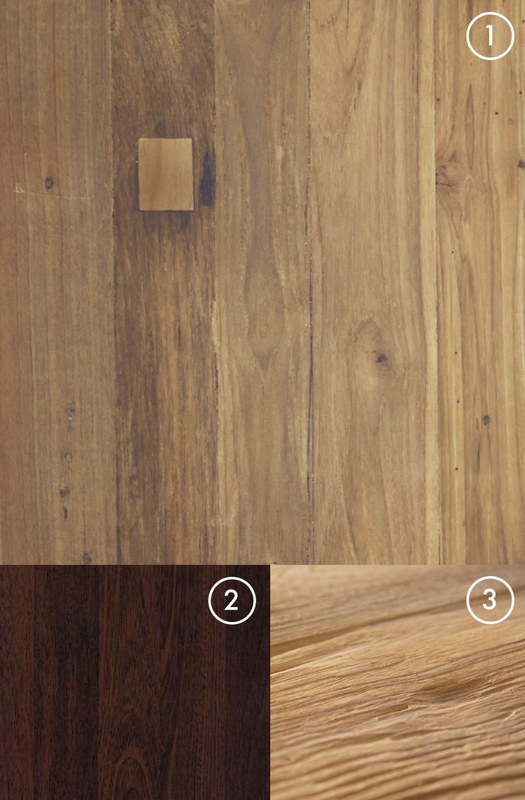 The wood used in our furniture is a natural product which has variations in grain and colour. These should be cherished as forming part of the individual character of your piece. You may find your item has small amounts of paint which are remnants of its previous incarnation. Indentations such as chisel marks are again natural markings which are left in. We could sand every piece of our rediscovered teak to a smooth finish but this would remove the individuality of the piece. ‘Blocking’ ( image 1)is where a mortice and tenon (cross beam hole) has been filled with a block of wood. This allows us to efficiently use each piece of timber we have reclaimed. (see pictures on below: examples of reclaimed teak markings and avaliable types).